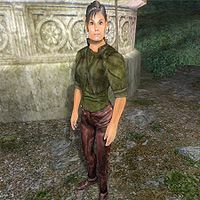 Boroneth is a Bosmer hunter who is a devout worshipper of the Daedric prince Hircine, and can be found with her fellow worshippers Hunting Tail and Vajhira at the Shrine of Hircine. Boroneth wears a lower-class outfit consisting of a stitched green shirt, laced leather pants, and a pair of stitched leather shoes. She is armed with her iron bow and arrows, along with an iron dagger. She also carries a few pieces of gold. If you speak to her before beginning Hircine's Shrine Quest she will say "This ground is sacred. Show respect." She spends day and night worshipping at the Shrine of Hircine, and divides her time between kneeling in front of the three lit candles, preaching from behind the lectern or simply relaxing on one of the benches.